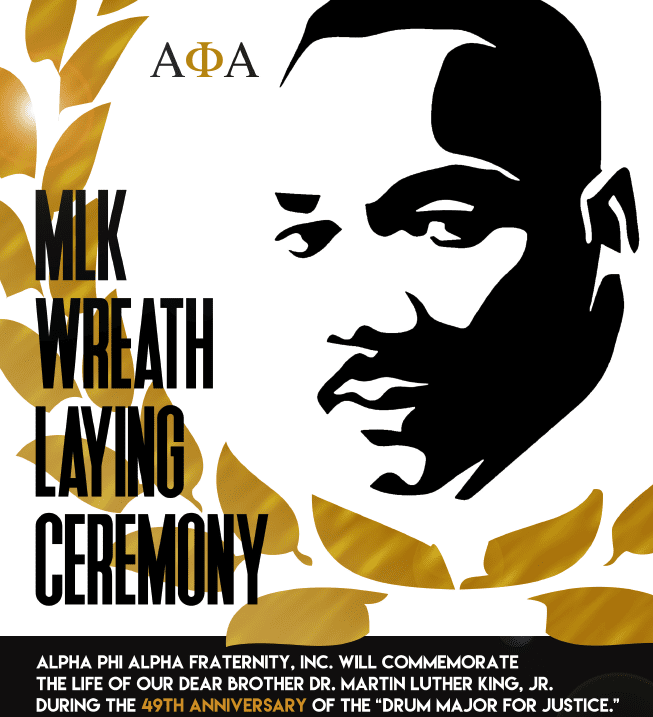 The Tau Lambda Chapter of Alpha Phi Alpha Fraternity, Inc. will commemorate the 49th Anniversary of the death of Dr. Martin Luther King, Jr. with a wreath laying ceremony on April 4, 2017 at the Martin Luther King, Jr. Magnet School located at 613 17th Avenue N, Nashville, Tennessee. The ceremony will begin at 6pm-7pm. Dr. King was a member of Alpha Phi Alpha Fraternity, and the brothers of Alpha use this ceremony to celebrate his life and his legacy. The Tau Lambda Chapter invites you to join them in this 49th Anniversary celebration of the “Drum Major for Justice”.